The Ariana Institute for Wellness Education offers an outstanding resource for those interested in advanced massage therapy techniques, featuring topics that include Sports Massage, CranioSacral Therapy, Chair Massage, Addiction Recovery and Therapeutic Massage. The Ariana Institute’s Advanced Massage Therapy Techniques Manual is part of a series of massage manuals that are designed to help deepen the knowledge and understanding of current massage therapists and introduce new, upcoming massage therapists to the world of massage and bodywork. To order your copies of the Ariana Institute’s Advanced Massage Therapy Techniques Manual visit www.amazon.com/author/arianavincent. 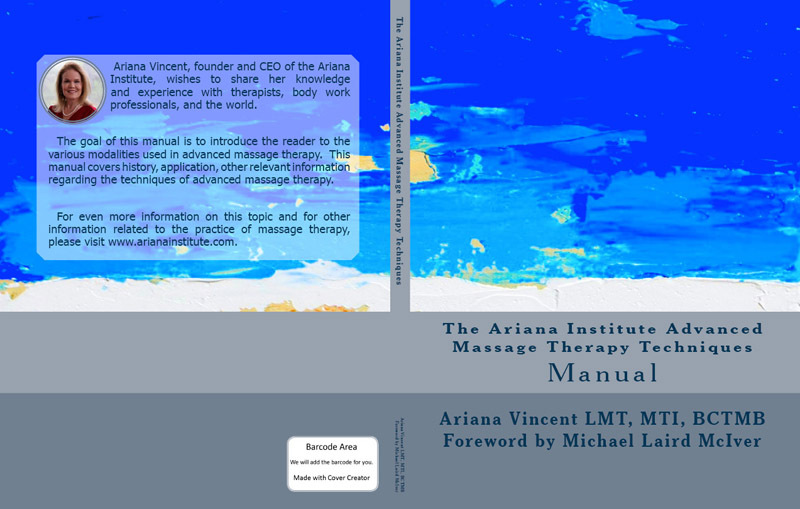 This manual incorporates detailed protocol descriptions, high definition instructional photos, links to the Ariana Institute’s online instructional videos demonstrating a wide variety of techniques, marketing and practice building strategies, and resources for advanced learning to encourage a comprehensive understanding of therapy modalities that can be offered in a massage practice. The Ariana Institute’s therapy manual series has been over 16 years in the making and is a monumental achievement for the Ariana Institute. The Advanced Massage Therapy Techniques Manual is a perfect source of deep study for massage therapists and those seeking to further cultivate their practices and expand their understanding of advanced massage therapy techniques! Here is the foreword to the Ariana Institute’s Advanced Massage Therapy Techniques Manual by Michael Laird McIver, Certified Advanced Rolfer, MTI, and CE Provider. The field of massage therapy and bodywork is growing and flourishing throughout the United States. The number of hands-on, touching modalities has exponentially expanded. People across the country now regard massage as an integral part of their personal path toward wellness and vitality. In Texas, well over 30,000 people have become licensed massage therapists. As the number of practitioners has grown and as their skills have matured, there has been an increasing demand for continuing training at more advanced levels. Most states that license massage therapists require regular continuing education. Leading lights in the world of massage training include James Waslaski, Whitney Lowe and Dr. Ben Benjamin. These teachers present at major massage conventions and produce articles for massage publications as they work to develop and refine the art and practice of massage. They are massage therapy stars. In Austin, Texas, there is a rising star who is well known and beloved in the thriving massage community of this exciting, creative city. Ariana Vincent has been a professional massage therapist for over 30 years and a licensed massage instructor for over 14 years. She has taught advanced massage techniques and styles to thousands of massage therapists nationwide. Already honored as a Pioneer of Massage, she was inducted in the World Massage Festival’s Massage Therapy Hall of Fame in 2013. Throughout her career, Ariana has been a strong voice for professionalism and ethics in the practice of massage therapy. I am grateful to have been asked to write this foreword for the Ariana Institute’s Advanced Massage Therapy Techniques Manual, one of eight professional massage manuals published by the Ariana Institute, a school that is dedicated to teaching massage techniques to thousands of massage therapists across the country. Techniques presented in this manual include sports massage, CranioSacral therapy, chair massage, and a well-researched section on the value of therapeutic massage in the process of recovery from addiction. The proliferation of gyms, jogging trails, soccer fields, home exercise equipment, and hotel exercise facilities attest to a growing interest in physical well being. This fitness boom has its pitfalls that are becoming epidemic. This is evident in the number of yoga injuries, chronic pain from uncoordinated jogging, muscle strain and joint injuries from lifting weights incorrectly and injuries related to undertraining prior to athletic events. This has been a windfall for massage professionals who specialize in sports massage. In this section of the Advanced Therapy Techniques Manual, Ariana discusses the long history of sports massage and then teaches a variety of useful techniques, benefits and contraindications. Each of her online massage courses includes a high definition video in which Ariana expertly demonstrates each technique. Together, the manual and the videos are powerful teaching tools. The next section of this manual deals with the subtle practice of CranioSacral Massage Therapy. First explored by the pioneering work of Dr. William Sutherland, D.O., CranioSacral Therapy examines the delicate pulsation and movement of the cranial bones and the transmission of movement through the cranial and spinal membranes that enfold the brain, spinal cord, and nerve roots, which contain the cerebrospinal fluid. In a balanced body, the cranial bones move subtly, the spine extends, the sacrum gently rocks, and these rhythmic motions circulate the cerebrospinal fluid to nourish the central nervous system. The appropriate function of this deep, internal system is reflected in emotional and psychological as well as physiological health. This chapter explores the work and teaching of Dr. John Upledger, D.O., the modern-day innovator of a simplified system of CranioSacral Therapy. The chapter on chair massage is especially useful. This form of massage is becoming more and more popular as increased awareness of the value of massage therapy permeates our culture. A 15-minute chair massage is a quick and easy way to let go of some of the buildup of daily stress we all experience, and is convenient for people who don’t have time for a full body massage. Any massage therapist who studies this section and the accompanying video will easily be able to begin a flourishing and lucrative chair massage practice. Her suggestions on choosing and buying a top-quality massage chair ensure a successful launch into the world of corporate chair massage. In Houston, large companies with thousands of employees, like Chevron and Shell, regularly employ chair massage therapists, as do many natural food stores like Whole Foods Market. Included in all her teaching of the many massage techniques Ariana has mastered are thoughtful and sensitive suggestions about the art of massage therapy beyond the hands-on technique and application. These include ideas about preparing an inviting and professional office, meeting and greeting clients, the cultivation of good active listening skills and attuning to the energy and needs of one’s client before, and during, the massage. These are skills we all need to practice, and are evidence of Ariana’s professional competence and mastery shaped by decades of excellence. Ariana is sharing her wealth of knowledge gained during a long and successful career. This clarity and caring is especially evident in Ariana’s chapter on the value of therapeutic massage in the treatment of addiction and recovery. The value of using loving, holistic and gentle healing touch to assist individuals in their struggle to free themselves from substance addictions has only recently been researched and understood. Removing the substance that an addict craves to mask his or her pain leaves him or her to face withdrawal, anger, frustration, stress and the need to detoxify in order to cleanse the body of residual toxins. Massage therapy can soothe and facilitate the slow process of healing from addiction. In addition, eating disorders and depression can also be treated, and recovery assisted, by caring massage. I found Ariana’s sensitive writing and her compilation of relevant articles on addiction and recovery to be fascinating and informative. I believe that addiction specialists and recovery centers have only just begun to understand the value of massage therapy in the process of recovery and that Ariana Vincent’s work in this area is timely and vital as more and more people face their addiction challenges and their hope for recovery. The Ariana Institute’s Advanced Massage Therapy Techniques Manual is a valuable addition to the library of any dedicated massage professional. Ariana has distilled expertise gained through over thirty years of hand-on experience and teaching into a tool that can enhance the technique and knowledge of all massage therapists. 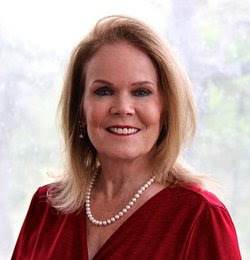 Her concise writing, excellent teaching videos and her grace and passion for her craft are all wonderful contributions for aspiring massage therapists who wish to hone their skills to a finer edge. The Ariana Institute’s video introduction for the Sports Massage, Addiction Recovery and Therapeutic Massage, CranioSacral Therapy, and Chair Massage CE courses can be accessed below or on the Ariana Institute’s YouTube Channel at www.youtube.com/user/ArianaInstitute. To order your copies of the Ariana Institute’s Advanced Massage Therapy Techniques Manual visit www.amazon.com/author/arianavincent.